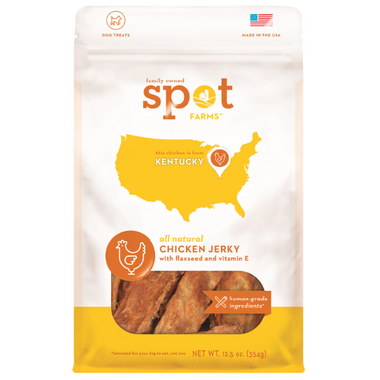 Spot Farms Chicken Jerky Dog Treats are made with nutritious, human grade ingredients like Omega 3-rich flaxseeds and Vitamin E-rich sunflower oil. Each piece of delicious, all natural jerky is cooked in small batches using simple, wholesome recipes. Your dog will “spot” the difference!